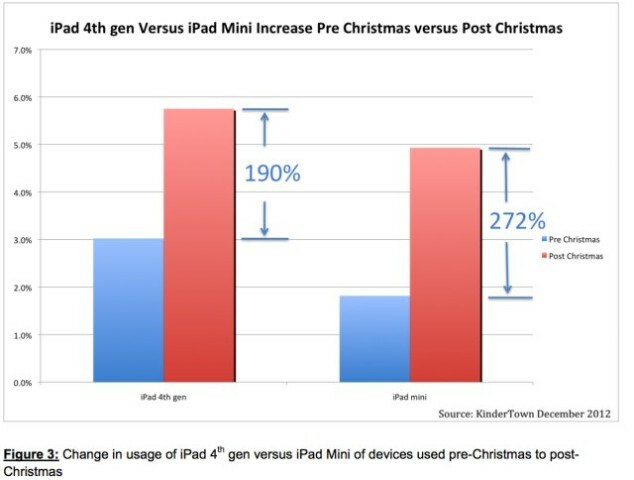 KinderTown, an educational app finder for parents of preschool and kindergarteners, reports (Via Techcrunch) that iPad mini usage increased dramatically after the holidays, suggesting that parents opted to surprise their young kids in December with Apple’s smaller tablet. 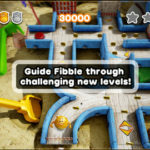 After analyzing the data supplied by the app’s 200,000 install-base, the developers gave some insights about how children use their new devices. 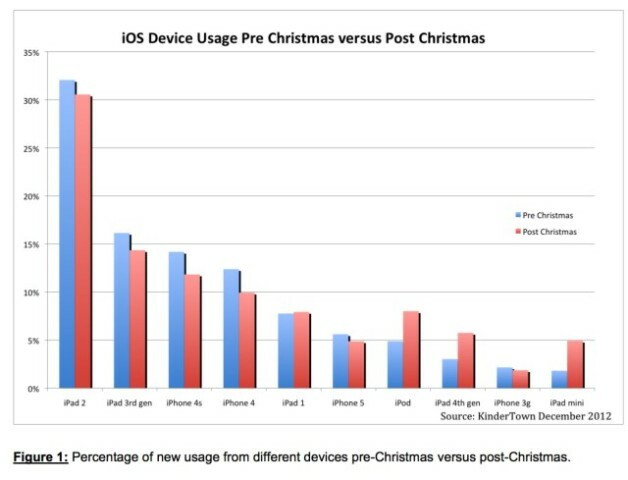 They noticed that the number of iPad mini users has drastically increased the days after Christmas, compared to the pre-Christmas period. But it turns out the iPad mini isn’t the only gadget gaining traction during the holiday period: the fourth of fifth generation iPod Touch and fourth generation iPad usage also jumped this time. The iPad mini along with the latest iPod Touch and iPad were clearly the biggest gainers. KinderTown users are almost exclusively parents with young children or teachers in early childhood education. This group has always favored the iPad for educational gaming so it’s not surprising to see the latest devices increase in popularity; however, parents clearly chose the iPad Mini over the new iPad. There is also some evidence that the older iPads are being “passed down,” as usage of the original iPad increased. Not to be ignored, iPod also posted big gains. 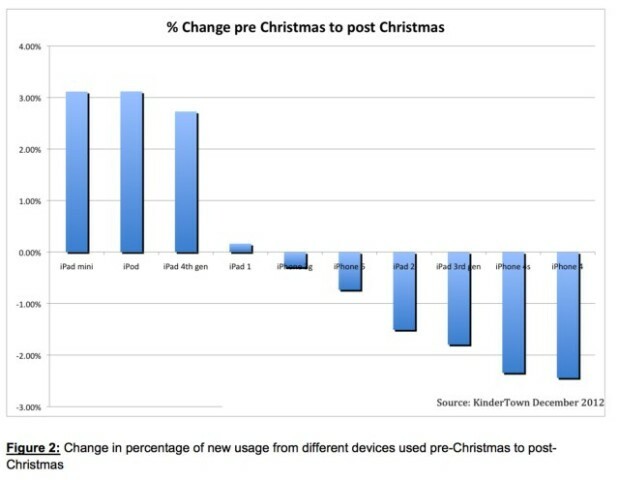 As you can see from the above chart, KinderTown’s users preferred the iPad 4 over the iPad mini in total, but the 270% increase recorded after Christmas suggests iPad minis are purchased at a faster rate than the iPad 4 (which recorded a 190% increase).